At The School of Natural Health Sciences we believe that good maintenance of our bodies, minds and relationships is the key to happiness. Yoga is a holistic practice which works on all these aspects to form the perfect activity that helps heal and strengthen all three. By involving your partner, lover or friend in couples yoga and trying postures where deep breathing and meaningful movement is involved, it invigorates each others body, builds up trust and supports understanding of one another. The effects it has on a relationship can result in improved levels of communication, a fortified bond and an open field for emotional expression. Even without a partner, yoga is a seriously beneficial activity which, scientifically speaking, is a preventative medicine. 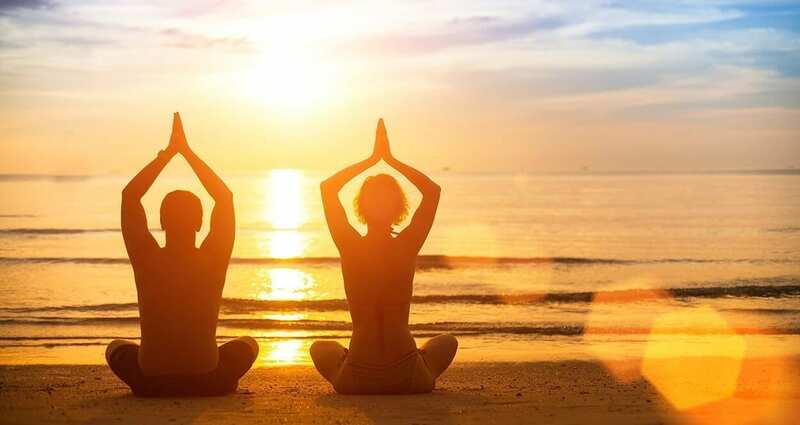 All the major diseases we experience as a population due to prolonged stress, poor diet and exercise habits, and being in a bad mental space can all be eased, even cured with regular yoga sessions. Emotional pain or turmoil can be managed, decreased and released if given the chance. Yoga helps us find that inner place of peace where the healing process can manifest. After all, the body is designed to heal itself, as nature intended, we just need to provide it with a good platform. For now, you can follow this adorable, lazy-morning couples yoga sequence from ieva wildlovebeamer’s YouTube channel. Thanks Eva! We hope you all have a meaningful Valentine’s day filled with moments that matter. With love, from the SNHS team. Our online learning facility offers an accredited diploma-correspondence course in Yoga. With an 80% pass mark you receive an internationally recognised qualification which entitles you to practice and teach. Become enlightened by the techniques, postures and stretching exercises, that work to tone the body and enhance the mind. The course includes a detailed routine which is easy to follow, bringing the benefits of stress relief and mind clarity. For any enquiries you may have, please contact us here, we’d be delighted to hear from you!